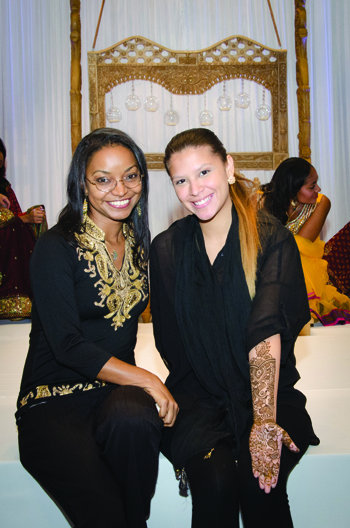 Recently, Desh-Videsh sat down with the winner of the 2013 Fort Lauderdale MyShadi Bridal Expo Mehndi Competition, Heather Tench Camillo, henna artist with The Henna Company in Miami, Florida. Learn more about Heather and what inspired her winning design. Heather Camillo: As a young woman I was always drawing. I even thought of becoming a permanent tattoo artist. While trying to pick my own permanent tattoo placement, I discovered henna and fell in love with it. I then read every book I could find on it, about designs, the history and recipes, so I could mix it myself to get the best color at it’s freshest. Camillo: Being a self-taught henna artist, it feels wonderful to be a representative of a traditional art and introduce it to new generations. I am proud to have learned this art form, and I look forward to sharing it with others. Camillo: After hearing from my friends and family that I should pursue body art professionally, I decided to go for it. I was really nervous at first about doing bridal henna, but I really enjoy being able to share my artwork with a bride during such a big moment in life. I am happy to preserve this tradition. Camillo: When it comes to henna, I can be very competitive and a perfectionist. I chose a blend of designs making one beautiful piece that was both traditional and had a modern feel. Camillo: In addition to bridal henna, I also provide make-up services. I also work with a Bollywood dance group, who can provide dance lessons. DV: What is the biggest lesson you learned your first year in business? What was the biggest lesson you learned in this past year of business? Camillo: In my first year I learned that understanding the clients needs is important. Being able to provide different design styles to fit what she has in mind and to fit the budget. I am constantly pushing my self to learn new designs to make this possible. Camillo: I received an email from an out of town college student who is also an aspiring henna artist. She was so busy with her classes and had a short engagement period. Before she knew it, her wedding was coming up fast. By the time she contacted me, I had a very busy week of weddings already. After showing me the design she wanted, we agreed on an early morning time before one of my other appointments. I did her bridal henna, and she loved it. After her wedding, she sent me pictures of the ceremony. We are now friends and keep in contact. Camillo: The economic downturn has definitely been difficult for everyone. By offering different henna packages that make it possible to have that dream wedding without breaking the bank has worked for me. Fortunately, the economy is on the rise again. Camillo: I am based in Miami, Florida, and I do travel to near by cities. I can travel along the east coast with ample notice. Camillo: If it’s in your budget, think about contacting a wedding planner. Be sure to find them early! Camillo: Book your henna artist as soon as possible! Most brides book an artist about 6 to 12 months in advance. If you should find yourself looking for an artist at the last minute, it really helps to have an idea of what style of mehndi you would like or even some pictures to help visualize what you are looking for.